JACKSONVILLE, Fla., (April 25, 2016) – For years, Wounded Warrior Project® (WWP) has partnered with organizations that share the WWP mission to honor and empower Wounded Warriors. Through a continued partnership, WWP will be supporting The Mission Continues, another veteran service organization (VSO) that gives injured veterans a chance to use their skills and talents to give back to local communities. WWP’s commitment to The Mission Continues builds on the idea of putting the injured veteran’s needs first and turning our past VSO competitors into allies by establishing relationships with organizations like Team Rubicon and America’s Warrior Partnership, Inc., which are designed to dramatically improve services being provided to injured veterans and their families. Through support provided by WWP, The Mission Continues has been able to establish 30 service platoons in 2014, and 31 in 2015. Service platoons are teams of veteran and civilian volunteers that mobilize together to solve a specific challenge in their community. 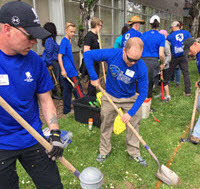 Over 6,400 platoon members participated in more than 280 service projects in 36 cities nationwide. By the end of 2016, a total of 70 service platoons will be operating thanks to the support of WWP’s continued support..
WWP’s support of other VSOs allows these exceptional organizations to operate in underserved areas, fulfill a need outside the scope of WWP’s direct programs and services, or enhance existing WWP programs with services or support that amplifies our existing work. Between 2012 and 2015, WWP has supported than 90 organizations that share the WWP vision of fostering the most successful, well-adjusted generation of wounded service members in our nation’s history. These partnerships have allowed more than 95,000 wounded veterans, 6,500 family support members, and 3,900 children across the country to access life-changing programs and services. The mission of Wounded Warrior Project® (WWP) is to honor and empower Wounded Warriors. The purpose of WWP is to raise awareness and to enlist the public’s aid for the needs of injured service members, to help injured servicemen and women aid and assist each other, and to provide unique, direct programs and services to meet their needs, free of charge. WWP is a national, nonpartisan organization headquartered in Jacksonville, Florida. To get involved and learn more, visit woundedwarriorproject.org.